So it's official: Dyson wants to build an electric vehicle to take on the likes of Tesla and all the traditional car makers looking to put together petrol-free motors. We've only just had the announcement straight from Dyson, but 2020 is the scheduled date for the EV's launch. What is this battery-powered car going to look like? Is it in fact a car or will it be something different? Will you have to part with your life savings to get one? Will it vacuum the road as it takes you from A to B? We'll try and answer as many of your questions as we can. If you haven't noticed, it's 2017, which means we're looking at a three-year wait before the Dyson EV hits the road. At a round table discussion with the media on Monday September 25, Sir James Dyson said his company was investing £1bn in the car itself and a further £1bn in the 'solid state' (not lithium-ion) batteries that will power it, with two 'competing' teams working on the latter. A total of 400 staff are working on the vehicle at present, with Sir James claiming a total of 4,000+ was possible by the end of the project. The first Dyson car will, not surprisingly, be at the pricey end of the market, but "a range" of vehicles is eventually planned. Like most expensive cars being planned or produced now, the first vehicle will have certain autonomous features, but not be fully self-driving. Sir James also apparently "hinted that prospective buyers may be able to put deposits down on vehicles before 2020," according to the Daily Telegraph. There is also this rather brief social media announcement made by the company. 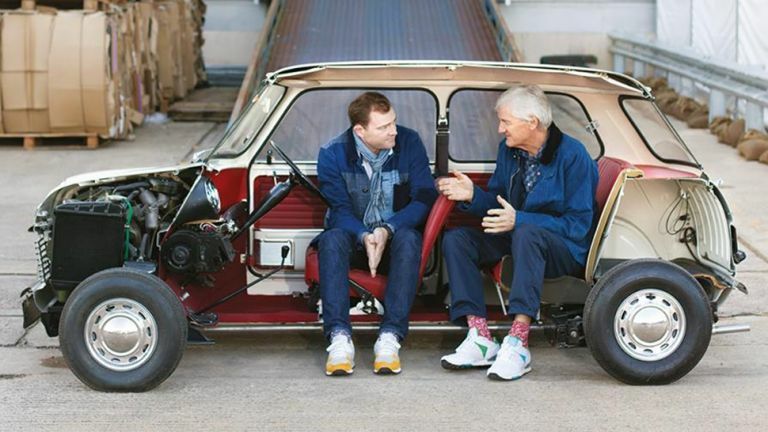 "Some years ago, observing that automotive firms were not changing their sports, I committed the company to develop new battery technologies," explains James Dyson in an email to employees (and now the world at large). "At this moment, we finally have the opportunity to bring all our technologies together in a single product," the knight of the realm continues. "I wanted you to hear it directly from me: Dyson has begun work on a battery electric vehicle, due to be launched by 2020." That's as much as we get on the vehicle itself - Dyson says "fierce" competition means he can't divulge any more details - but the memo goes on to say that the EV team is already 400 people strong and that the company will be investing £2bn on the project. The entrepreneur finishes by quoting a statistic that nearly 9,500 people die each year in London from long-term exposure to air pollution, and that's the motivation driving Dyson's development of its own EV. Dyson the company has certainly become known for its engineering innovation and expertise throughout its 30-year history, but so far that innovation has focused on cleaning floors, drying hands, heating air and most recently drying hair. Jumping from those household projects to a fully fledged electric vehicle is a big leap, but it sounds like Dyson has the manpower and the finances to give it a good go. We can expect something "quite radical", according to the Guardian. Right now we know hardly anything about the Dyson EV - what it will look like, how it will work, what technologies it will incorporate, how much it will cost... all of this remains a mystery as the Dyson team works away in secret. All we have to cling on to is that 2020 launch date, and as new developments are announced we'll be sure to share them with you here. If it's at the top end of the market, we can expect something more like the BMW i3 or a Tesla, rather than something along the lines of a Nissan Leaf or a Renault Zoe. That's the approach Dyson has taken with practically all of its products, after all. We know from previous leaks that the project has the backing of the UK government, to the tune of £16 million – chicken feed, in the car world – and that former Aston Martin and ex-Tesla staff are also involved. The as-yet-unnamed car is going to be developed at Dyson headquarters in Malmesbury, Wiltshire, and considering it's such a stretch from the products that Dyson currently makes, the company is going to have to do some serious expanding. That process is already underway - in 2015 Dyson bought the solid state battery company Sakti3, and there are rumours that computer experts from Silicon Valley are also being hired - could self-driving tech and AI play a major role in the Dyson EV? Considering the way the industry is going, you would think so. There's a lot we don't know about this car yet, but from the hints we've got so far, we'd say it's a good bet that we're looking at something more high-end like the Tesla Model S.
The Government of the UK has announced new petrol and diesel cars will be banned by 2040. In his memo to his employees, James Dyson made note of the strong competition in the electric vehicle market, but in fact it is a relatively new market. All the big motoring brands may be working on electric cars right now, but their expertise is in the petrol and diesel vehicles that are set to be banned within a couple of decades. That's why, as odd as a homewares brand such as Dyson stepping into the market may appear at first glance, we shouldn't rule them out. Tesla is the name most synonymous with electric cars and Elon Musk's company has only been in business since 2003 – although admittedly, that's quite a head start on Dyson. Having started off at the premium end of the market, Tesla's newest Model 3 is designed to be the affordable electric car for everyone, and the first models rolled off the production line in July. As innovative and forward-looking as Tesla has been, the production problems that continue to hamper the company's efforts are a warning sign to Dyson that building EVs isn't easy - not so long ago the rumour was that Apple was about to join the fray, before thinking better of it. Meanwhile just about every other car maker on the planet is now rolling out its first electric cars, which means Dyson has got an awful lot of more experienced competitors to go up against. Volkswagen, to take just one example, is looking to release 30 electric cars in the next decade. Dyson can succeed with its first EV, but it's got a lot of hard work ahead of it - we'll be keeping a close eye on what the company reveals between now and 2020. Liked this? Remember when Dyson made futuristic-looking hair dryers?